Blue Circles Gilbert Yeung is one of high-performance audios more iconoclastic figures. He designs and builds components that he likes, and that stretch the boundaries of the norm. Anyone who saw the mannequin he built for Montreals Festival Son & Image a few years ago, with little amplifiers in the pumps, a preamp in the handbag, and round Gallo speakers in the brassiere, will never forget the sight -- or the surprisingly excellent sound. But thats Gilbert Yeung: to the end, his own man. So when Yeung e-mailed me to ask if Id be interested in his new BC310FY preamplifier, I wasnt sure what to expect -- he would give me no details of the design until I agreed to review it. Id heard one earlier BC preamplifier (the entry-level CS) and enjoyed it, and I own a USB Thingee. I was looking forward to what Yeungs restless creativity had come up with. But nothing could have prepared me for the BC310FY -- which means its a Blue Circle Audio product all the way. 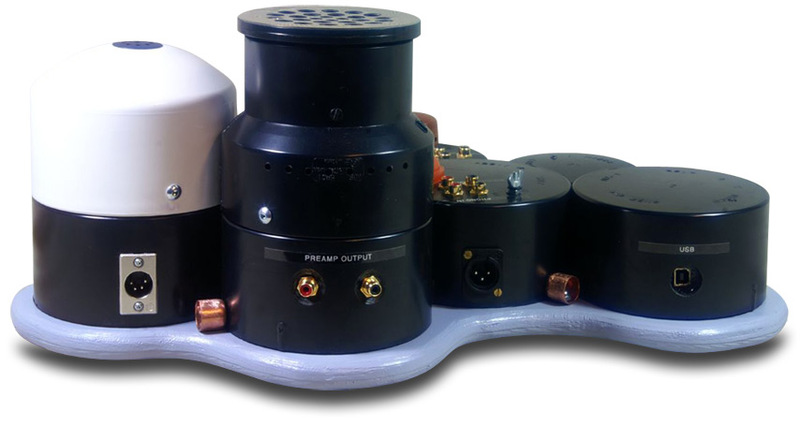 Gilbert Yeung builds his preamplifier out of ordinary materials -- hes nothing if not thrifty. The case, such as it is, is mostly made up of various lengths and diameters of ABS pipe. The BC310FY looks like a miniature oil refinery. You can buy a bare-bones BC310FY for $4500 USD, or fully loaded with all bells and whistles for $6250 (like the review sample), or anywhere in between. 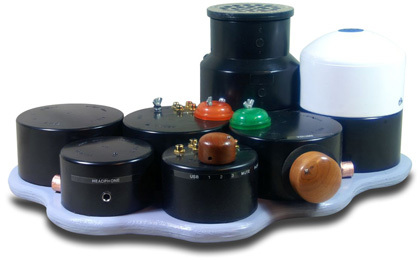 The middle front length of pipe houses the three line-level inputs and input switch (all switches are made of wood). To the left is a pipe housing the volume pot (a remote control is optional). At the far left rear is one housing the 16/44 USB input ($350, with a 24-bit/96kHz DAC forthcoming, price TBD). At the far left front is another pipe, for the headphone jack ($800). The rear-middle pipe contains the phono stage ($600). The tallest pipe -- the one at the rear, with the perforated top -- houses two 6922 tubes, the B+ power supply, the control circuits, and the output jacks to the power amp. The nearly-as-tall tower at the far right, with the white dome, is for the onboard power supply and more B+ power supply. Two half-spheres of translucent plastic -- an orange one atop the phono stage, a green one atop the volume stage -- have wing nuts to grant access to control these stages gain. All jacks are single-ended only. There is a mute feature using the input switch. The only odd thing about the BC310FYs layout is the location of the input jacks: atop the input-selector tower. Wires stick straight up from the top. It doesnt look great, but Im told that this provides the absolute shortest signal path -- which may pay sonic dividends. The output jacks are at the rear. The entire preamp sits on a wooden platform stained gray. The oil-refinery look is continued in the BC310FYs huge outboard power supply, which links to the preamp via stranded wire and XLR connectors. Input connections for this are also at the rear. This supply, too, is made mostly of ABS pipe, with four towers of equal height sandwiched between two walnut-stained wooden rectangles and bolted together. My analog front-end was a VPI HW-19 Mk.IV turntable with SME 309 tonearm, Lyra Argo i moving-coil cartridge, and Furutech AG-12 phono cable. The digital source was an Esoteric SA-50 SACD/CD player. These fed an Audio Research LS17 line stage and PH5 phono stage, a Bryston 4B-SST� power amplifier, and an Original Electronics Master headphone amp. To check the quality of the Blue Circle BC310FYs USB input, I used my Toshiba laptop computer as a music server. Speakers were Paradigm Reference Studio 100 v.3s; headphones were AKG K701s. Linking everything were Analysis Plus Solo Crystal Oval interconnects and Solo Crystal Oval 8 biwire speaker cables. Ive replaced all stock power cords with either Harmonic Technologies Pro AC-11s, except for an Analysis Plus Power Oval 10 for the power amp. Accessories included two three-shelf Salamander Archetype racks, Furutech deStat LP treatment, a Blue Circle BC6000 power conditioner, a Hunt EDA carbon-fiber record brush and Zerodust stylus cleaner, and various tweaks from Symposium Acoustics: Rollerblock Series 2+s, Rollerblock Jr.s., Fat Padz, Pod Points, Ultra Platform, Svelte Shelves, and an Isis Shelf. My initial impression of the Blue Circle Audio BC310FYs sound was that it was smooth, with absolutely no hint of harshness. It tended to emphasize more of the harmonics than the initial transient. When listening to Rodrigo y Gabriela (CD, ATO 0030 88088-21557-2), the sound of the acoustic guitar was full and rich, if not as sharp as Ive heard through other preamps. But oh, what heavenly tones and timbres the Blue Circle produced. The BC310FY also had a way of making background instruments seem more a part of the whole. Take the accordion on Tom Russells Blood and Candle Smoke (CD, Shout! Factory 826663-11471). This instrument has sounded shunted to the background through other preamps, but with the BC310FY, while it was still back there where it should be, it sounded more defined, more clearly reproduced -- which made its contribution to the songs more appropriate to the manner Russell intended, I think. Voices were another of the BC310FYs strong suits. Whether it was the breathy loveliness of Holly Cole on her self-titled album (CD, Alert 6152810418) or the nasal sound of Arlo Guthrie on his Amigos (LP, Reprise MS 2239), the Blue Circle clearly delineated each voice within the soundstage, with no hint of homogenization. Each singer was portrayed in space three-dimensionally, which made him or her sound more real. The original Mobile Fidelity Sound Labs one and only SACD reissue, of Duke Ellingtons Blues in Orbit (UDSACD 757), highlighted many of the qualities that made the BC310FY so much fun to listen to. The bass was full and deep -- if not the last word in definition -- and laid a solid foundation, with wonderful separation of instruments, excellent tone and timbre, plenty of space, and superb delineation of instruments playing in the same register, such as the baritone saxophone and bass at the beginning of "Blues in Blueprint." While I found the dynamic range a tad subdued -- surprising, given the size of that outboard power supply -- it never affected the BC310FYs overall harmonic richness. That aspect remained fully fleshed out at all times. The Blue Circle handled the resolution of detail very well. I could hear poor production values, such as the too-sharp piano sound in "Waiting," from Norah Joness The Fall (CD, Blue Note 99286 2). With better recordings, the BC310FY reproduced each instrument realistically -- I loved listening to my collection of Dead Can Dance SACDs. I could even hear violinist Julia Fischer breathing during her performance, with violist Gordan Nikolic, of Mozarts Sinfonia Concertante, K. 364 (Pentatone PTC 5186 098) -- this took nothing away from the music, but simply added to the realness of the listening experience. Up to this point Id done most of my vinyl listening via my ARC phono stage. Given that the BC310FYs phono inputs are atop its phono-stage tower, getting my phono cable to reach that far required a little creativity in component placement. I was rewarded with a sound that had me wanting to listen far longer than I should have. The Blue Circles phono stage offered sharp, crisp, tight sound, with excellent top and bottom ends. Art Peppers alto sax on his Thursday Night at the Village Vanguard (LP, Contemporary 7642) was well centered and detailed. Some might want a touch more warmth, but thats a matter of taste. As it was, the BC310FY caught the essence of this live recording very well, with good senses of room and band alike. James Taylors voice on his second album, Sweet Baby James (Warner Bros. 274300), issued forth in all its glory, with a youthful suppleness that has unfortunately disappeared over the years, but that the BC310FY brought out clearly. The acoustic guitars on this album had a full-bodied sound, all plucked string and hollow wooden body. While the BC310FYs phono section sounded very musical overall, it wasnt the last word in detail or dynamic range. But for a section of a full-function preamp -- as opposed to a standalone phono stage -- I could listen to and enjoy it for years without feeling I was missing anything too important. At Gilbert Yeungs request, I unloaded the phono stage by removing the 100-ohm plugs, which he thought might improve the sound. Well, it changed the sound, but I cant say it was an improvement. While dynamic range and the overall level increased, a sense of cohesiveness seemed to disappear. It was a case of six of one, half a dozen of the other. I didnt play with the gain, as I found the factory setting ideal -- with the volume knob set between 11 and 12 oclock, I got all the volume I wanted, with no tube noise. When I use my Toshiba laptop as a music server with a well-designed USB input, the computers hard drive usually sounds slightly better than the original CD. The Blue Circle didnt disappoint in this regard. I heard no ugly sounds, which indicated that the BC310FY was keeping jitter at bay. Its addition makes the option of making your own version of a music server using just the BC301FY easy. I find this feature a positive sign for the industry as a whole -- simplicity is a good thing! Nor was the BC310FYs headphone jack a mere afterthought. Through my AKG K701s, I heard a sound that was the equal of any of the headphone amps Ive heard. When I listened to Closer to the Music Vol.3, the latest sampler from Stockfisch Records, the many acoustic instruments were accurately portrayed, and voices were clear and realistic. Using a compilation CD Id burned for my visit to the Consumer Electronics Show, I compared the Blue Circle BC310FY with my Audio Research LS17 preamp. If the choice came down to simply which one was "more musical," it would be a toss-up -- both offered very musical sound. But nothing is ever that simple. As I continued to listen to my demo CD, I began to pick out areas where the two preamps differed enough to matter. First, there was a clear difference in transient reproduction. The ARC is sharper on the initial transient, but not quite as rich in harmonic information as the Blue Circle. Recordings of both piano and drums bore this out: Each stroke of piano hammer on string or drumstick on skin was more realistically portrayed by the LS17. It wasnt a huge difference, but it was there. Bass was reproduced with more depth and weight by the ARC, but again, not to a large degree; and, as with the transient differences, the BC310FY was richer in bass reproduction. Both preamps handled voices very well -- in this regard, I could detect few differences that would cause me to prefer one over the other. The biggest differences between the two preamps are ergonomic rather than sonic. The ARC LS17 is a line stage only, the Blue Circle BC310FY a full-featured preamp -- though you can dispense with any or all of the latters accoutrements at will. Having the Blue Circles excellent built-in phono and headphone stages, and especially its USB DAC, are factors that must be considered. I could easily live with either and enjoy my music long into every night. But if I wanted to reduce the number of boxes on my equipment rack, then the BC310FY would be the way to go. Gilbert Yeungs latest design idea has panned out quite well. If you can get past the BC310FYs looks, youll be rewarded with sound that is always musical and enjoyable. There wasnt one part of the BC310FY that I considered dispensable. While the BC310FY wont be everyones cup of tea, it deserves to be heard. Who knows? Out of that audition, you might get more than you bargained for. Color me highly impressed. Price: $6250 USD as reviewed; base price $4500.